ANAROCK Property Consultants, which prominent real estate industry stalwart Anuj Puri launched last month, today announced that it has appointed Housing.com's co-founder and ex-CEO Rahul Yadav as Chief Product & Technology Officer. "This appointment is in line with ANAROCK's highly technology-driven orientation and business model for its residential advisory services," says Anuj Puri, Chairman - ANAROCK Property Consultants. "The online real estate business is still in its fledgling stage in India, and we are taking the lead on boosting it into maturity. So far, the real estate sector has not been able to emulate the success of ecommerce for consumer durables and services. We intend to change that, and Rahul Yadav's experience in harnessing the consumer housing market at via technology will add the key element. The cutting-edge and highly consumer-focused technology platform and support infrastructure we will build here will bring in a complete transformation of the residential property business." Indeed, real estate in India continues to see most of its success as an offline business, with very little technological innovation happening to speed up its adoption as a viable online business model. Real estate advisories, online property listing aggregators and even developers have made some headway, but this field nevertheless remains underserved because of lack of integration with credible expert offline advisory and transaction support. In short, the continued challenge lies in successful sales conversion in a manner which also places the customer's interests first. "Indian residential buyers and investors will not embrace an ecommerce model of property purchase unless they get a seamless experience from online selection to offline advisory and transaction closure," says Puri. "We have already pioneered this model in the Indian real estate space and will now back it with a robust technology infrastructure, in the building of which Rahul Yadav will now be instrumental. Backed by our firm business philosophy of ethics, integrity and values over value, we are now taking the online real estate business in India to the final level." Mr. Rahul Yadav has demonstrated outstanding success in setting up of a real estate search portal wherein prospective buyers can conduct housing searches based on geography, unit size and various other key factors. He has pioneered the verified listings and data approach to the online real estate business in India. 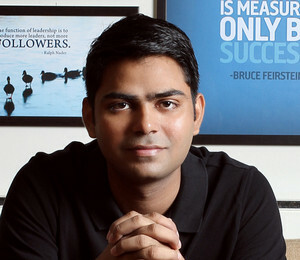 As the brain behind a highly successful, technology-intensive platform, Rahul Yadav's credentials are well-established. Before joining ANAROCK, Rahul also advised Lodha Group for a brief period. ANAROCK Property Consultants Pvt. Ltd..
Mr. Rahul Yadav says, "I consider my appointment as Chief Product & Technology Officer at ANAROCK Property Consultants the logical next step in my career, and it is of course a complete privilege to work with an outstanding industry leader like Anuj Puri. Given my product and technology background, I am fascinated by the highly tech-driven approach that ANAROCK is adopting for its residential real estate business, and I already feel very much at home here. I am extremely excited as I look at the immediate and long-term future of this company as a result of these innovations." Mr. Rahul, who will be based out of ANAROCK's Mumbai offices in Bandra-Kurla Complex, assumes his new role from today and is already building his team of product and technology experts.